Town defender Sonny Bradley has warned his team-mates to not be ‘fooled’ by Plymouth’s poor start to the season ahead of their clash at Kenilworth Road tomorrow afternoon. The Pilgrims head into the game sitting third from bottom in the table, with just three wins to their name from 17 games so far. However, Bradley knows full well just what the visitors are capable of, having been part of the Argyle side who were just a one point better off at this stage last term, before going on a stunning run that saw them narrowly miss out on the play-offs by a single victory. Boasting an attacking line containing Graham Carey, Freddie Ladapo and Joel Grant, Bradley knows he and his fellow defenders are in for a tough 90 minutes. He said: “They’re very good, as good as anyone attacking-wise in the league in my opinion. “So I’ve been saying to the boys all week, just because of their league position, don’t be fooled. “Graham on his day, is one of the best players in the division in my opinion. “Then you’ve got Grant, (Ruben) Lameiras and other players who can come on and affect the game. “It’s going to be a very difficult one for us on Saturday, especially defensively, but I think if we play like we have been, there’s no reason why we can’t handle that. “It was a similar time last season when we started kicking on and started doing really well, so I don’t think where they are in the league probably reflects how good they are. “As we know full well this will be one of the toughest games of the season. Argyle have improved slightly of late, with three wins from four league and FA Cup games, ensuring they are now off the bottom of the table. 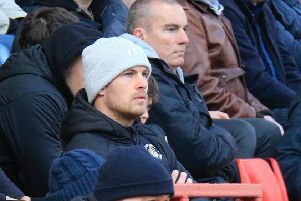 It’s another reason why boss Nathan Jones echoed Bradley’s note of caution regarding their opponents’ attacking outlets and current standing, saying: “Even behind them (the front three), they’ve got others, Lameiras and (Antoni) Sarcevic are good footballers and good players. So you’ve got to be wary, but at this level, everyone’s got a threat, there’s no blunt attack, so we’ve just got to make sure that we’re right at it and then we can go from there. “These are a good side though, they’re in a very false position. “They’ve got good players, really dangerous players and we’re going to need to be right at it to maintain our record, so we will prepare in the right way. “We’ve had a little bit of a disjointed week because of the Checkatrade game, so we’ll make sure we’re prepped and ready to go as it’s a big game. Bradley, who spent two years at Home Park, will have support in both sections of the crowd, adding: “I’ve got plenty of friends down there, still, some still play for the club who I consider my friends, and have got friends coming down who I’ll see after the game.